This paper brings the aid effectiveness debate to the sub-national level. We hypothesize the non-robust results regarding the effects of aid on development in the previous literature to arise due to the effects of aid being insufficiently large to measurably affect aggregate outcomes. Using geo-coded data for World Bank aid to a maximum of 2,221 first-level administrative regions (ADM1) and 54,167 second-level administrative regions (ADM2) in 130 countries over the 2000-2011 period, we test whether aid affects development, measured as nighttime light growth. Our preferred identification strategy exploits variation arising from interacting a variable that indicates whether or not a country has passed the threshold for receiving IDA’s concessional aid with a recipient region’s probability to receive aid, in a sample of 478 ADM1 regions and almost 8,400 ADM2 regions from 21 countries. Controlling for the levels of the interacted variables, the interaction provides a powerful and excludable instrument. 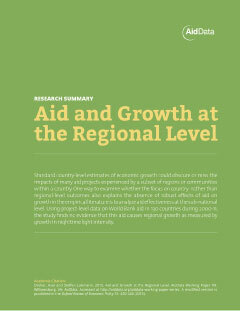 Overall, we find significant correlations between aid and growth in ADM2 regions, but no causal effects.